I decided where we would visit on our trip over Christmas and New Year's based on lists of cities with the best Christmas markets, the dates of said markets, and the proximity of those cities to one another. Since we'd already decided to start in Munich (reasonable airfares from Madrid, lots to see and do, etc), Salzburg seemed like an easy next choice, especially since Danny had been dying to get there so we could do the Sound of Music tour. D - I'm not sure if you think that last bit is a joke, or if so, why you would think it's a joke, but it's most certainly not a joke. I love The Sound of Music, and wholeheartedly believe, as any sane person would, that it's one of the best musicals of all time. I've got to save some of this for The Sound of Music post, but there...now you know. We took a train from Munich and arrived in Salzburg just before 6pm on Christmas Eve. Since Christmas Eve is a bigger holiday than Christmas Day in many European countries, I had a tough time finding somewhere for dinner, since many places were full by the time I started looking in early December, but finally did. After checking in to our hotel we headed to the Taj Mahal Indian Restaurant for a fantastic feast, complete with attentive service - plus lots of folks hoping to snag a last-minute table. 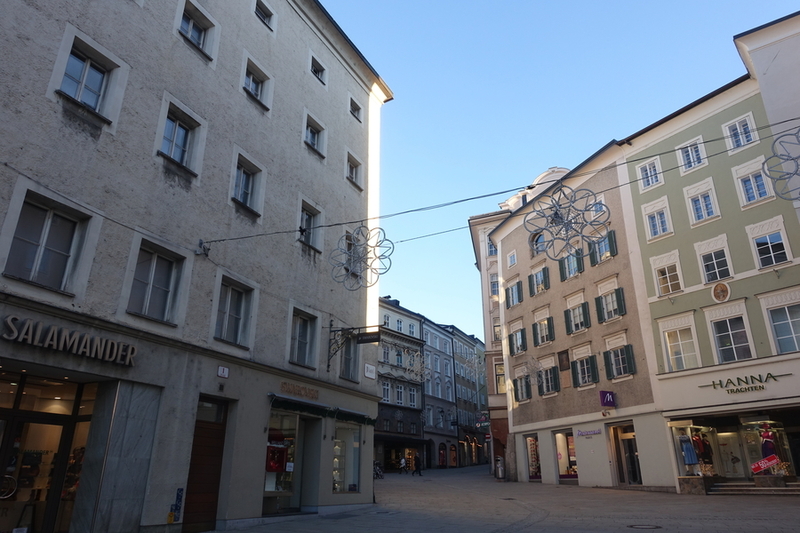 I planned a packed itinerary for us on Christmas, partially because I had a lot I wanted to see and do in Salzburg, and also because when you're not with family for the holidays, you might as well make the most of where you are. 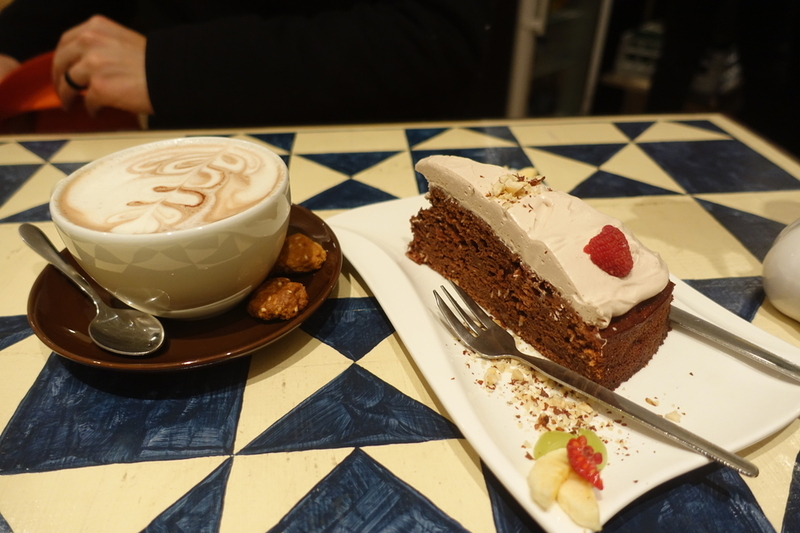 We started by walking the deserted streets to Kaffeehäferl, a coffee bar in the center of the city. We were served our breakfast treats (and hot chocolate! Do you see the size of that cup?!) by a helpful husband and wife team - and I decided once and for all that planning ahead is the way to go, especially with restaurants (two years prior we'd resorted to Starbucks for our Christmas morning breakfast when we sadly realized not much else was open on our trip to Vienna). D - While I do love Starbucks, it was nice to try a place that had a much more local vibe on Christmas morning. Along with the hot chocolate, the fried pancake-bite-things were especially good. To be honest, I've never been too impressed with any apple strudel I've had in Europe. It's not sweet enough for my American palette and I'm always subconsciously comparing it to apple crumble or apple pie (which is always a losing proposition for apple strudel). The strudel here was comparable to others I've had around the continent. After (so much!) consideration, research, calculations, and the like, I decided to buy 48-hour Salzburg Cards for our trip (we spent four nights in the city but really only had two full days as we took a day trip to Hallstatt). We bought our cards at our hotel on the night we arrived and begun our usage of them at the MönchsbergAufzug, or Mönchsberg Lift. The MönchsbergAufzug is really just an elevator to views over the city, but since we went fairly early in the morning (and Christmas morning at that! ), we were the only ones there, and the misty, peaceful panoramic views were fantastic. I tend to love the quiet, uncrowded spots best, and this definitely fit the bill, making it one of my favorite places we visited. Getreidegasse proved horribly difficult for us to capture in photographs, but take our word for it (and all those who have visited before and after us) - it's Salzburg's prettiest shopping street with intricate wrought-iron signs announcing the names of shops. The street is so pretty and historic, in fact, that it's been a UNESCO World Heritage site since 1996. Mozart was born and lived in a house along the street until he was 17, now a museum called Mozart's Geburtshaus, or in English, Mozart's Birthplace (of course, right?). I have to be honest and say that neither Danny nor I knew much about Mozart prior to our visit, but we quite liked the museum. There wasn't too much information which was nice for those of us who just wanted a little, but there were opportunities to really 'dive deep,' too if that's your thing. D - I enjoyed checking out Mozart's old digs but it was really drafty in there and it was a very cold morning. Maybe they're trying to make things feel more authentic or something but museums are usually a place to warm up! On another note, I didn't know that Mozart had written so many letters in his lifetime and it was cool to read some of those. Hidden in a courtyard between buildings and accessible only by a greenery-trimmed and Christmas tree-lined passage is the Sternadvent Salzburg, a Christmas market offering lots of handmade goods and Christmas cheer. Salzburg didn't have many Christmas markets going on while we visited, and while this one was small, its festive cheer was strong and not to be underestimated! A definite do-not-miss while in the city at Christmastime. Our next stop was Dom zu Salzburg/Salzburg Cathedral, the city's main church, and a very grand, Baroque one at that. We weren't able to do much more than take a quick peek, however, as a service was just getting started - we made sure to stop in for a better look later on. Surrounding the church on two sides is the Salzburger Christkindlmarkt. This annual Christmas market is one of the world's oldest, dating back to the 15th-century, but has (understandably) seen some changes throughout the years. Since 1974 the market has carried on from the first Sunday of Advent until December 26th, much as we saw it when we were in Salzburg. Carriage rides, an ice skating rink, stalls selling a variety of foods both sweet and savory, plus greenery and lights strung overhead make for a very fun and festive atmosphere both during the day and once the sun goes down. We enjoyed many meals and treats at the market both on Christmas and the day after - in particular, käsekrainers (sausages filled with cheese) for Danny, different types of pretzels, and apfelradln (apple slices that are battered and fried - ours also came with an amazing vanilla sauce). Those apfelradln...if you know how to make them, send us a message!! D - I think this might've been my favorite Christmas market that I've been to yet, or at least shortlisted on my top 3. The food was phenomenal! If you've never enjoyed a sausage filled with cheese before, I proffer to say that you haven't really lived. And those apfelradlns? Never before (okay, maybe once or twice before) has a food made me want to purchase a deep fryer so much! Also, as Shannon mentioned, the variety of pretzels and pretzel shaped pastries on offer was staggering. Looking at the pictures now, I'm realizing that I mixed up the Theatine church in Munich with the Salzburg Cathedral in my recollection. 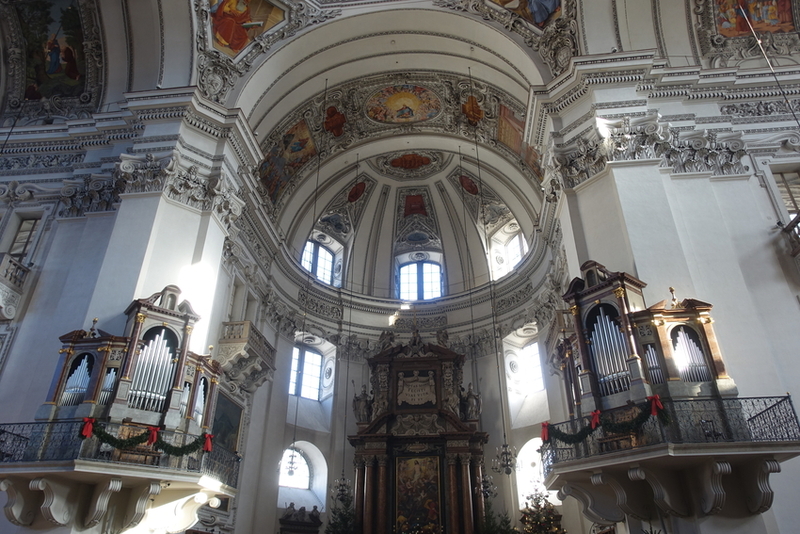 In our Munich post, I wrote about how I was struck by the white interior of the Theatine church carved with deep, dark accents, but I was actually thinking of the Salzburg Cathedral. Anywho, it's a gorgeous piece of marble (or whatever things are made out of), and the Theatine church was still pretty nice too. Not far from the Salzburg Cathedral is the entrance to the Festung Hohensalzburg/Hohensalzburg Fortress funicular. Once at the top, we entered the centuries-old fortress, checking out the different views of the city and the small (and, in our opinion, unimpressive) Marionette Museum which is located inside. D - I had such high hopes for the Marionette Museum, expecting it to be really quirky and cool. Sadly, the most interesting thing that happened there was when I started messing around with a couple marionettes that were set up for people to try out, and a big crowd of museum-goers gathered around to watch, leaving me feeling embarrassed and inadequate as a puppeteer. I'm guessing that people mostly visit the fortress for the amazing views, rather than for the marionettes. We'd thought that we'd be racing to get through everything on the docket for the day, but we ended up with some time to spare, so we visited the DomQuartier, where we couldn't take photos aside from the part that took us into the cathedral's organ loft, which gave us a unique perspective into the church we'd already visited twice earlier in the day. There were also chances to go outside as we went from building to building, offering a bird's eye view of the Christmas markets all lit up as the early evening mist set in. Our last stop of the day (before a final feast at the Christmas market of course ;)) was the Salzburger Weihnachtsmuseum/Christmas Museum. Housed in a former cafe, this year-round museum seemed like the perfect place to be on the day it celebrates. We looked at old Advent calendars, nutcrackers, Santas, art, ornaments, trees, and even a traditional 'Christmas room.' The visit took us about 45 minutes in total and was (like everything else we did that day) included with our Salzburg card, but since it was so different from most other museums we often visit (history museums, art museums, and the like), it felt like a really welcome change of pace and one I'd recommend, especially if you're visiting Salzburg during the Christmas season. D - To answer your question, yes, that is a blueberry cheesecake pretzel below. The next morning, we took a much-anticipated Sound of Music tour around Salzburg and the surrounding area (stay tuned - Danny and I decided it deserves its own post! ), and in the afternoon we took a trip to Untersberg. I selected the 48-hour Salzburg Card over the 24-hour one so that we could visit Untersberg on our second day with the card, and thankfully, it didn't disappoint. Public transportation to and from the cable car, as well as the cable car journey itself, were all included with our Salzburg Card...and here's where I tell you that for ease of navigation (and not having 100+ photos in this post), I'm saving our time at Untersberg for another time as well. Coming soon, though!! When we returned from Untersberg, we walked along a section of both sides of the Salzach River lined by grand, stately houses (some now converted into offices). We made our way back to the Christmas market for a final hurrah - both ours and its, as it was indeed December 26th and the last day for the market until next year. We happily ate one more pretzel and apfelradln, as well as bought a tiny nativity scene we'd been eyeing throughout all our visits over the past couple of days as a little souvenir. That wasn't dinner, though - we ate at Organic Pizza, a tiny little place where we had slow service but no matter...after a series of meals eaten standing up at markets, enjoying something made by hand (I'm not just saying it - we watched them!) where we could sit down and shed our coats wasn't such a bad thing. On our last day, we finagled our way to Hallstatt, somehow figuring out the bus-train-ferry combination that we needed to in order to spend the day in the picturesque, Instagram- and Pinterest-famous town. We were back in Salzburg for dinner, though, and we ate at one of three or four tables at GustaV, the city's first vegan bistro and cafe. Our food and service were good, but the dessert tasted healthy...if you know what I mean. And before we took the train to Ljubljana the next morning, we ate breakfast in our hotel room. We didn't have a fridge in the room, so the night before we bought muesli and bananas, and in the morning, Danny popped out for yogurt so we could put together a quick, easy breakfast. I can't wait to finish telling you about our adventures that we took from Salzburg - the Sound of Music tour, the trip up Untersberg, and our day in Hallstatt. The combination of the three, plus the time we actually spent in the city made for a pretty great Christmas. We began our travels in Munich and continued on to Salzburg, which is about a tenth of the size of Munich. I might assume that a bigger city would be a better place to spend a holiday (i.e. Christmas, in this case), but Salzburg didn't really leave us wanting for anything - in fact, we loved the feeling of having places to ourselves, but being able to mingle with the crowds at the markets when we wanted to. Two full days seems about perfect for exploring this Austrian city, especially if you're going to get out to see Untersberg and/or take a Sound of Music Tour - just make sure you leave time for a day trip to Hallstatt!